The Beach Apartments at Broadbeach opened in 2014 with the launch of 40 apartments with a value of $20 million already sold. Broadbeach has been an attractive area for buyers and renters for many years. It is located on the beach and right next to Surfers Paradise. It is also home to Jupiters Casino, Pacific Fair Shopping Centre and the Gold Coast Convention and Exhibition Centre. Colliers International representative Peter Chittenden believes it is a turning point in the Gold Coast apartment market. “The Beach offers the sort of combination that many buyers look for, headlined by a great location, value for money, with a quality developer and builder profile and a reasonable expectation for an up-side when the project is finished.” he said. Since the 1980s investment and development in the Gold Coasts high rise and apartment sector has been strong and consistent. Jupiters was the first casino in Queensland when it opened in 1986 while Q1 in Surfers Paradise is the tallest building in the Southern Hemisphere. 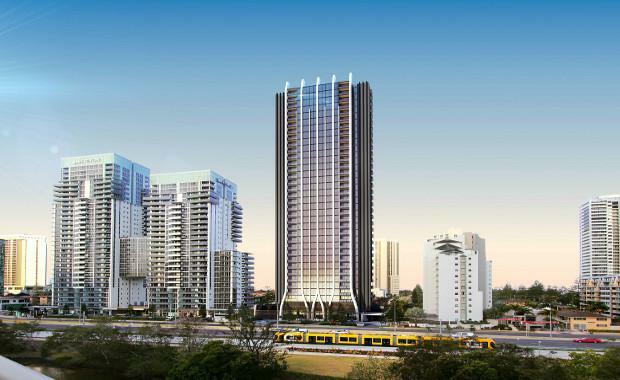 “Among interstate buyers, Broadbeach already has a well established reputation as the Gold Coast’s premier apartment location- given the suburb’s proximity to the beach, the new light rail network and surrounding lifestyle amenities. In combination it all comes together to deliver a lifestyle offer that is clearly very appealing. The quality of apartments like The Beach has improved in leaps and bounds to accommodate a more demanding and design, quality driven buyer. It’s a trend that developers and their architects and builders are aware of and are responding to with some really appealing product,” said Chittenden. The Gold Coast is Australia’s sixth largest city. Including the Tweed it is home to more than 605 000 people with a five year growth rate of around 11.2%. Chittenden says that growth is predicted to rise over the next three years and the weak Australian dollar means tourism will continue strongly. He believes that the Gold Coast is an undervalued market because it is the last area to feel the property boom that has hit Sydney, Melbourne and Brisbane. The Beach Apartments will have almost 70% of their 219 apartment’s featuring ocean views. One bedroom apartments will start from $330 000. Jupiters Casino and Pacific Fair Shopping Centre are currently undergoing a $670 million redevelopment and both properties will be within walking distance of the apartments. The Beach Apartments are being developed by joint venture partners Anthony Moreton Group and Pryde Group, with Brookfield Multiplex as Development Managers and Builder. DBI Design are the project architects, their past projects have included the well-known Mirage Resorts at Southport and Port Douglas and more recently high-profile projects include Soul, Q1 and Oracle. CEO of Anthony Moreton Group Tony Hazell says local Gold Coast residents looking to downsize and enjoy the Broadbeach lifestyle have also been attracted by the two year settlement which gives them time to plan for their next move. The building will feature a variety of DBI designed facilities including a podium level outdoor pool and BBQ, Zen-garden, Residents Lounge, a gymnasium and ground floor retail, for interstate and local investors there will also be access to on-site management.